As many of you know, consignment stores are in the business of selling items on behalf of other people. These people are called “consignors”. We accept items we believe we can sell to our customers and pay the consignor their portion. The details of this business model vary greatly among consignment stores. In this blog entry I want to explain a few of the most misunderstood policies we’ve adopted over the past several years. Some of these policies were adopted to fix problems while others helped us become more efficient. Checks Only – We only provide payouts to consignors with checks. This way there is proof that a payout was made with signatures. We need proof because we’ve had occasions when consignors have forgotten they received a payout. We’ve NEVER provided payouts in cash, VISA cards, PayPal, etc.. Consignors can use their account balance as a credit to purchase items in the store at any time. Oddly, we’ve had some consignors never pickup their checks. For that reason we void checks that haven’t been picked up after 30 days and return the amount back to their account. Monthly Payouts – Consignor payouts are only completed on the 16th of each month. This policy helps organize payouts to consignors. Years ago, before we implemented this policy a portion of each day was being consumed by check payouts. While we understand our consignors want their money we had to find a better way to manage the time being consumed. After researching what other consignment stores were doing we decided to go to this once-a-month system. The policy allows consignors to submit their payout requests at any time but payouts would only be made once a month. All payout requests must be received by 4:30pm on the 15th of the month. Checks are available for pickup after 12pm on the 16th of each month. Checks are either held at the store for pickup or mailed to the address on the account. It is important we have the correct mailing address. We utilize a service that mails the checks so a $1 fee that is deducted from the balance. Also, checks that are mailed require an additional 3-5 days to process and mail. $20 Minimum Payout – This policy simply means to request a payout each month your account balance must be at least $20. Some consignors have misunderstood this policy to mean they had to reach an account balance of $20 to receive a payout. That is not correct, there are exceptions. For example, if your account balance is under $20 and all your items have sold you may receive a payout. We had to implement this rule because we had MANY consignors requesting payouts when their balances were just a few dollars. Every time the consignor had an item sell they’d request payout. This greatly consumed time and checks. 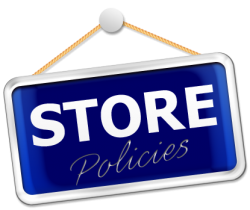 I hope this blog entry describing some of our store policies helps our consignors understand why these policies are in place. A complete list of policies are available here.